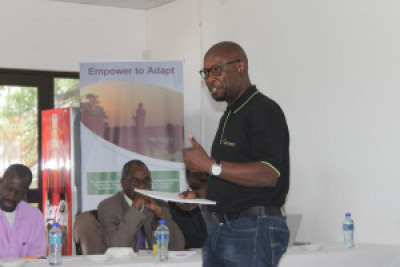 Rundu, Namibia – A series of regional inception workshops to launch the Empower to Adapt: Creating Climate Change Resilient Livelihoods through CBNRM in Namibia or the CBNRM EDA Project kicked off in Rundu, Namibia on 4th December 2017. The Green Climate Fund, a special financial vehicle created through the United Nations Framework to Combat Climate Change, has financed the 5-year project. Presiding over the opening session, Hon Dr. Samuel Mbambo, Governor of the Kavango East Region, noted that his region was of high biodiversity significance due to ongoing conservation efforts of fauna flora and the institutional efforts of communal conservancies and community forests. Hon. Mbambo, however, said that the gains made by the CBNRM programme, which has given Namibia worldwide acclaim are being eroded by the negative impacts of climate change. “We can simply not continue business as usual when our livelihoods are rendered vulnerable due to unpredictable climate patterns,” said Hon. Mbambo. Implemented by the Environmental Investment Fund of Namibia (EIF) and executed in partnership with the Ministry of Environment and Tourism, Ministry of Agriculture, Water and Forestry and umbrella body for CBNRM organizations NACSO the project looks to build the resilience of more than 76,000 people living in CBNRM areas, improve the management of 7.2 million hectares of communal areas in Namibia and develop community-level strategies that will reduce climate change threats to local livelihoods. The workshop was attended by representatives from registered and gazetted conservancies and community forests who were given a brief overview of the CBNRM EDA project, introduced to the governance framework and given an opportunity to contribute to the finalization of the project work plan. Planning around the project components was the central focus of the working group sessions with the Component 1 costed at US$ 272,000 looking at creating climate change awareness and supporting local level climate monitoring. Component 2 revolves around the establishment of a Resilient Grant Facility that will be hosted at the EIF with a total budget of US$ 8.6 million. Director of Operations at EIF, Karl Aribeb urged representatives of conservancies, community forests and CBOs present to look at developing proposals in the 3 investment windows namely – Climate Resilient Agriculture, Climate-proof infrastructure and Ecosystem based adaptation. “We hope to have raised the necessary awareness on climate change and its impact on CBNRM in time for the 1st Call for Proposals during the 1st quarter of 2018”, said Selma Shitilifa, Project Manager of the CBNRM EDA Project. The series of workshops are planned for Rundu and Ongwediva and expected to be wrapped up in Windhoek on 8 December 2017.